Although previous studies have examined adaptive capacity using a range of self-assessment procedures, no objective self-report approaches have been used to identify the dimensions of adaptive capacity and their relative importance. We examine the content, structure, and relative importance of dimensions of adaptive capacity as perceived by rural landholders in an agricultural landscape in South-Eastern Australia. Our findings indicate that the most important dimensions influencing perceived landholder adaptive capacity are related to their management style, particularly their change orientation. Other important dimensions are individual financial capacity, labor availability, and the capacity of communities and local networks to support landholders’ management practices. Trust and confidence in government with respect to native vegetation management was not found to be a significant dimension of perceived adaptive capacity. 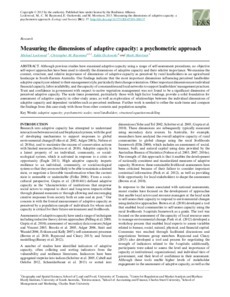 The scale items presented, particularly those with high factor loadings, provide a solid foundation for assessment of adaptive capacity in other study areas, as well as exploration of relationships between the individual dimensions of adaptive capacity and dependent variables such as perceived resilience. Further work is needed to refine the scale items and compare the findings from this case study with those from other contexts and population samples.